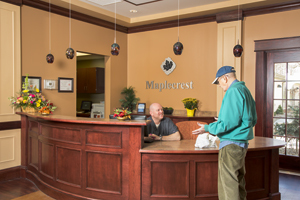 Maplecrest is a licensed 55-bed skilled nursing and rehabilitation facility offering both short and long term care services. The newly expanded and renovated building offers private rehabilitation suites as well as private and semi-private accommodations to meet your needs. A beautiful and expansive therapy gym provides an enjoyable environment for those in need of therapy services. Residents diagnosed with Alzheimer’s disease or dementia are protected using our Resident Guard ® security system. The historical Creed family home provides an enjoyable setting for dining or visiting. Nestled within a quiet neighborhood, our outdoor spaces and enclosed courtyard offer peaceful settings for your enjoyment. The new Community Room at Maplecrest provides a large, comfortable space for you or your loved one to enjoy all of the various social activities offered within our facility. Our activity personnel ensure that the social and spiritual needs of each individual are identified and fulfilled. During our daily activities, our trained activity coordinators and personnel strive to keep residents engaged mentally, physically, and socially. Maplecrest and our residents are proud to be active members of the community.